An author, activist, and cultural analyst, Eric Liu teaches civic leadership at the University of Washington (UW), founded the Citizen University project, and hosts the cable interview show “Seattle Voices.” His celebrates the publication of his new book “A Chinaman’s Chance: One Family’s Journey and the Chinese American Dream” with a book launch at Town Hall on July 8. He took some questions over e-mail. NWAW: Where did you grow up and what are your most important memories from childhood? Eric Liu: I grew up in Poughkeepsie, N.Y., in the Hudson Valley. My parents were born in China, went to school in Taiwan, and came to the United States to work and go to college. My strongest memories are of our family, in the midst of suburbia, doing things that were a hybrid of Chinese and American. Like having Hamburger Helper with stir-fried green beans on the side. Or my dad trying his best to play baseball with me, even though he’d never played it himself. Or the sounds of loud and raucous mah-jongg games in the study, while the cousins were in the TV room watching Christmas specials. Or waiting impatiently for Chinese school on Sunday to end, so I could go home and build forts in the woods with my friends. NWAW: What were your most memorable experiences writing speeches for President Clinton? What was it like to work with the chief executive behind the scenes? Eric Liu: By far the most meaningful speeches I worked on for President Clinton were for the 50th anniversary of D-Day in Normandy, France. To be a son of immigrants, a Gen-Xer writing for the first Baby Boom president as he honored the GI generation — that was an experience that made me appreciate how much opportunity this country has created for me — and how much I need to make sure to pass it on. President Clinton was great to work for. He had an avuncular way with me. He also, being a master reader of people, could read my earnest sense of service and civic purpose. The last thing he said to me when I left the White House was “Go forth and do good.” And I took those words seriously. NWAW: What is the nature of your work at UW? How has your experience here gone so far? Eric Liu: I’ve lived in Seattle for 14 years and my daughter has grown up a Seattle girl. This is home. I love being a part of this community and in all my national work, I love telling people that Seattle has it all: beauty, diversity, ingenuity, and soul. I love teaching at the UW because I love working with and learning from young people. And the organization I run, Citizen University, does national work, but tries to carry a Seattle spirit of openness and creativity everywhere we go. NWAW: How have your ideas about Asian identity grown and changed over the years? Eric Liu: When I wrote my first book, “The Accidental Asian,” in 1998, I was ambivalent about pan-ethnic, pan-Asian identity. I recognized that the creation of the Asian American identity was a classically American act of communal self-invention. But I worried that it didn’t have enough cultural content to hold it together. In the years since, much has changed, but two things in particular. First, moving to Seattle and becoming involved in the Asian community here. One of my earliest mentors in Seattle was Kip Tokuda. Kip brought me into the board of the Asian Pacific Islander Community Leadership Foundation (ACLF), and more than that, he helped guide me in politics and civic involvement, and just life. I miss Kip a lot. Through ACLF, I made good friends. And by the example of people like Uncle Bob Santos and Ruth Woo and, of course, Assunta Ng, I came to see the power of pan-ethnic Asian community identity. The second big thing was the birth of my daughter. As she’s gotten older (and I have too! ), I’ve valued more than ever my Chinese-ness and have worked to keep her exposed to Chinese language, ideas, culture, and values. I suppose it’s the oldest second-generation American story, but it’s true. I now embrace my heritage more strongly than ever. NWAW: What are the major ideas you explore in your new book? Eric Liu: First, what it means to be Chinese American in this age of China versus America. I reflect a lot on the mix of perceived threat and opportunity that accompanies China’s rise, and how those perceptions influence how we Chinese Americans are understood — either as people with enviable and sometimes mysterious power (Tiger Mom, anyone?) or as people with menacing and perhaps dangerous influence (Wen Ho Lee, anyone?). The second idea is that no matter how big China’s GDP gets, America will remain indispensable if we maintain our openness to immigrants. 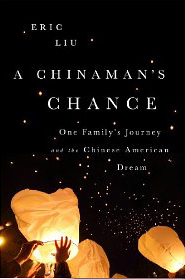 To put it simply: America makes Chinese Americans, but China does not make American Chinese. And it doesn’t want to. That’s America’s advantage. The third idea is to unpack what Chinese-ness is, in values and language and social norms. I believe that there is a Chinese American way, found in people like Maya Lin or Gary Locke or Tony Hsieh, that can fuse the best aspects of each culture. And it’s up to America to identify and reward this way if this country is to fulfill its potential. NWAW: How did you get into hosting “Seattle Voices”? What approaches do you take to hosting? Eric Liu: My hosting of “Seattle Voices” grew out of the research I did for my 2004 book “Guiding Lights.” I’d spent many months traveling the country and interviewing life-changing mentors and teachers. And when I came back, I didn’t want to stop. So I proposed doing a show in the same spirit, but one focused on the people of our city — leaders and innovators who you may never have heard of, or whose names you see in the news, but you don’t know their back-story. By asking them who influenced them and how they pass it on, I could unlock stories that could inspire and teach others. We’ve been doing the show for over 10 years now and I feel like we’ve created a collection that expresses a certain sense of the kind of city we are. NWAW: What are your plans for the future, after promoting this book? Eric Liu: My plans for the future are to expand the work of Citizen University, whose aim is to revive a culture of powerful, engaged citizenship in our community and country. We work with immigrants, veterans, students, artists, innovators, activists, and educators from across the political spectrum and across ethnic and regional lines. I was absolutely enthralled with your last speech about being dependent and asking for help being the true meaning of strength. Do you hire out as a speaker?